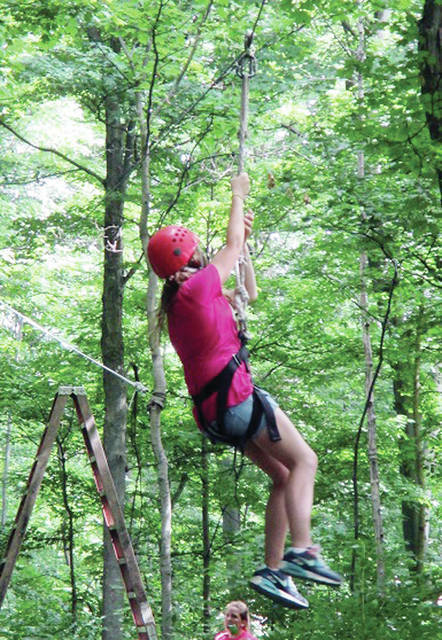 Camp Palmer in Fayette will host a free open house full of family activities on Sunday, Oct. 7. The 11th Annual Celebrate 4-H Camp Palmer Open House will be held Sunday, Oct. 7, 11 a.m.-4 p.m. The public is invited to this free event at 26450 County Road MN in Fayette. The celebration is geared toward the whole family and for all ages. Activities may include carnival games with pumpkin painting, wagon rides, the camp store, zip line riding, rifle events, the nature center, a climbing tower, archery, gaga ball, and canoeing, among others. Craft and specialty vendors will be in Woodland Lodge. There will also be the 3rd Annual 5K run/walk beginning at 9:30 a.m. The course will start and end in camp. The route will include roads around camp and Harrison Lake State Park. Awards will be given to top finishers in each age group. A registration form may be printed from www.camppalmer.com, or register online at Davesraces.com. A freewill offering picnic lunch will be provided on a first-come, first-served basis from noon-2:30 p.m.
For additional information, call 419-237-2247 or email 4hcamppalmer@gmail.com. Camp Palmer is owned and operated by 11 counties in northwest Ohio and is also an outreach of the Ohio State University Extension. https://www.swantonenterprise.com/wp-content/uploads/sites/23/2018/10/web1_camp-palmer.jpgCamp Palmer in Fayette will host a free open house full of family activities on Sunday, Oct. 7.